This is our all-natural candle. 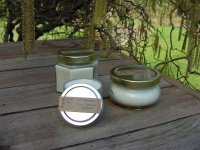 Not only is it made with pure soy, it is also scented with only pure essential oils. To use as a massage oil, melt a small amount of wax and put the candle out. Let it cool slightly, then put small amount of wax in hands. Rub your hands together and apply the oil to skin. Works well as a wax treatment for the hands!